$514.99 Seen a lower price? $554.94 Seen a lower price? The Korg MicroKorg XL + starts with the same powerful MMT synthesis and 8-voice polyphony as the original MicroKorg XL and adds PCM dedicated to sought-after vintage keyboards instruments. 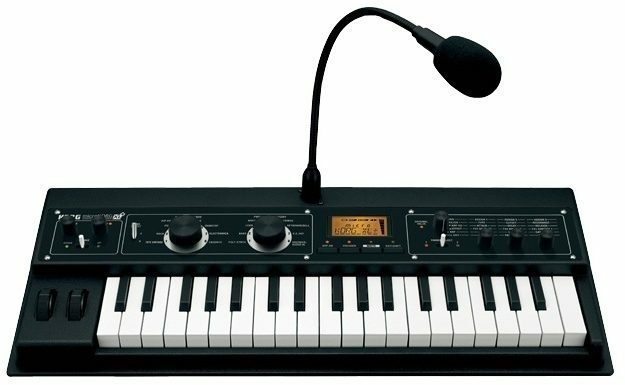 The sixteen band vocoder offers unique Formant Shift and Formant Hold functions, and includes a gooseneck mic. Download the free editor software. Multi Modeling Synthesis (MMT); dual KAOSS derived effects processors; 16-band vocoder hot-rodded with Formant Hold and Formant Shift functions - MicroKorg XL + has it all. 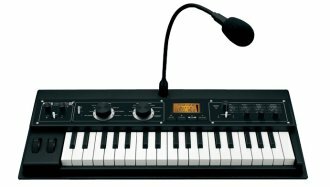 MicroKorg XL+ comes equipped with the piano sound from Korg's classic stage piano, the SGproX as well as its hard-edged grand-type electric piano. For years, the microKORG has been the world's top-selling music synthesizer. Now, the microKORG XL is ready to join the Korg line-up. Based on the same winning combination of a small footprint, mini-keys, battery-powered portability and huge Korg sound, the microKORG XL is ready to expand your musical vocabulary. The fun factor is huge, too. A gooseneck microphone is included for instant synthesizer vocoder excitement, right out of the box! The microKORG XL music synthesizer carries a proud pedigree. The MMT (Multi Modeling Technology) sound engine is descended from the RADIAS/R3 synthesizers, while the dual effects processors come down from the famous KAOSS line. The microKORG XL also offers remarkable playability. For example, the black key/white key proportions have been adjusted for easier chording and the key response has been improved for rapid-fire soloing. And the old -school square front keys? Well, they look wicked cool! Together with a sound-bending vocoder and six-pattern arpeggiation, microKORG XL packs a powerful sonic punch. The eight-voice MMT synth engine in the microKORG XL music synthesizer offers traditional analog waveforms plus a total of seven algorithms, including formant waveforms, noise, and PCM/DWGS waves for those vintage keyboards and strings. Cross-modulation, unison stacking, and VPM (Variable Phase Modulation) let you create sounds that would be impossible for a conventional PCM synthesizer to generate. Sync and ring modulation also make it easy to create complex and powerful sounds. Two multi-mode filters, a drive/waveshaping circuit for distinctively distorted sounds, and EG and LFO for creating time-varying tonal change, all provide plenty of parameters for serious synthesis. Virtual Patching brings it all together. Seventeen up-to-the-minute effects deliver everything from a traditional chorus all the way to grain shifting. In addition, delay effects can be synchronized to a MIDI clock for "beat-sensitive" situations. You can even process external sounds! The microKORG XL's amazing vocoder adds vocal characteristics to any sound, creating everything from pseudo choirs and talking instruments to vintage Sci-Fi robots. Our unique Formant Hold allows you to freeze the vocal input for continuous vocoder effects. You can also use the Formant Shift function to adjust the level and pan of each of the sixteen bands, greatly altering the tonal character. The distinctive retro-styling of the microKorg XL music synthesizer allows for quick selection of any of the 128 on-board, editable programs. For the diehard synthesists and sound designers, the three performance edit knobs provide for fast and effective editing...You're also free to select and assign your favorite parameters! Download the free Editing software and manage sounds on your computer! - Operates on battery power or an adapter for musicians on the go! - Easy-to-read display makes editing a snap. - Dimensions: (W x D x H) 21.89 x 9.09 x 2.87"
Available until 11 PM (EST) today. Mention special code 206-30D7 when you call.